A Lancashire council has agreed to back the restoration of a Grade II listed theatre building. Lancaster City Council voted to bid for a £12.8m government grant to reopen Morecambe's Winter Gardens theatre. The council said it would apply for a grant from the Sea Change programme, set up to regenerate coastal towns. A spokesman added that concerns other venues, including Morecambe's Platform, would be closed if the council backed the Winter Gardens bid were unfounded. The spokesman said: "The council does not, in principle, support a restructuring of its cultural services to help finance the Winter Gardens project." He said it would not support "the closure of the platform facility or the redirection of other resources away from cultural venues across the district". The Friends of the Winter Gardens group welcomed the backing from the council. It did, however, question how the council would support the project if the grant was not approved. 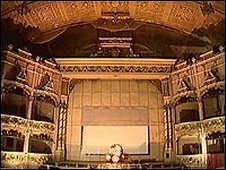 The Friends of the Winter Gardens have campaigned since the mid-1980s to have the historic venue reopened after it closed in 1977 due to unsustainable losses. The Winter Gardens complex of buildings, which included a ballroom, seawater baths and bars, opened in 1897. The theatre, based on a redevelopment of the Peoples' Palace and neighbouring baths, is now all that is left of the original complex.